For decades, Playmobil eschewed licened properties, even as Lego hit a boom thanks to its partnership with Lucasfilm. But after founder Horst Brandstätter died in 2015, the company began taking small steps into the world of licensing - first partnering with Funko to release oversized figures based on TMNT, Doctor Who, and similar nerdy sources, and then finally with actual sets based on Ghostbusters. Rustin already looked at the entire lineup in a Spoils of the Week a while ago, but I found a Stay Puft when I was checking out JC Penney's increased toy selection, so I decided to give it a whirl. Mr. Stay Puft is, of course, the mascot for Stay Puft Marshmallows, one of the many high-quality products made by the Comm Core Corp. Stay Puft marshmallows have been a family favorite since the early 20th century, perfect for roasting around the fire or snacking on the go! Stay Puft Marshmallows: stays puffed, even when toasted! Since this is a Playmobil release, you'd expect it to look like Playmobil, right? 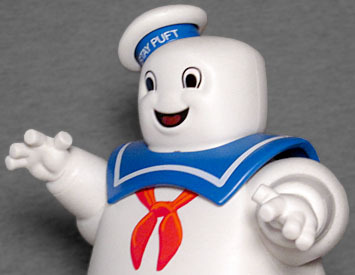 After all, the Minimate Stay Pufts looked like Minimates, and the Lego Stay Puft looked like Lego. But Playmobil Stay Puft? Looks like a miniature Stay Puft! This is every bit as on-model to the movie design as any of DST's banks or even Mattel's big foamy figure! He's got the puffy limbs, the flat, rounded fingers, and even the bulbous body. This is the Stay Puft Marshmallow Man, with no qualifications about the design. There are, however, a few qualifications about the sculpt. 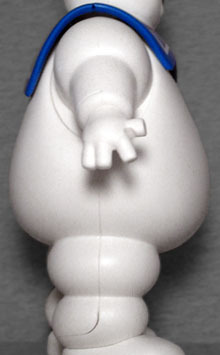 For one thing, this Stay Puft, like almost all the merchandise, gets the shape of the head wrong. Look at the movie: his head is significantly wider than it is tall, but everyone who makes toys of him tends to make it almost square. Maybe the licensors won't approve a sculpt that's the right shape? It's entirely possible, but we have no way of knowing. 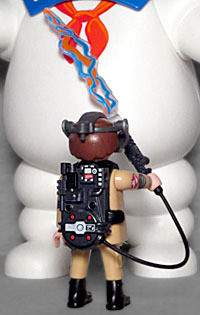 More glaringly, however, both of Mr. Stay Puft's red ribbons are merely painted on, not sculpted. The bump on top of his hat and his giant collar are both sculpted elements, and the collar even gets a molded line for the outside edge of its white stripe, but the ribbon on the hat and the neckerchief are just tampos. The paint on them is good, suggesting highlights and shadows, but it's still just paint, for no clearly discernable reason. 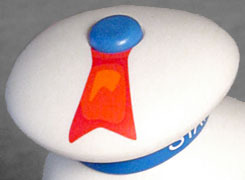 His mouth and eyes are given perfectly crisp paint apps, and even the Stay Puft name on his hat band is error-free. The articulation is necessarily sparse. Unless you're going to put joints in between every segment of his body, there really isn't a lot you can do with Mr. Stay Puft. This one gets swivels at the shoulders and wrists, and that's all. Really? No movement at all in the head? Maybe the shape of the collar would have made a neck swivel difficult, but how about a hinge, so he could at least look up (at the Ghostbusters on the rooftop) or down (at the people he's steping on)? Were Mr. Stay Puft sold by himself, there wouldn't be anything about him that really identified the set as a Playmobil release. Perhaps that's why he's boxed with his best buddy in the whole world, Stantz. Yes, just "Stantz," no Ray. Sure, he's called "Ray" more often than anything else in the movie, but no time to worry about that now! Stantz can join your other favorite characters, like "Spengler" and "Zeddemore" and "Peter." Ray is a typical Playmobil "klicky" (as fans call the figures) painted up in Ghostbuster jumpsuit beige. Since he's paired with Stay Puft, he's also been splattered with goo. Hot, sticky goo. The white paint apps are limited to his chest - not even his head or back. The face is the generic Playmobil smile, without anything to really identify him as Dan Akroyd, but the suit itself is tampoed with all the appropriate details: belt, zippers, pockets, pads, logo, everything. Ray's accessories include ghost goggles mounted on a head frame, and a backpack that supports his proton pack. In other words, "some (minor) assembly required." There's also a translucent energy effect to go on the end of the neutrino wand, to make it look like the proton stream is firing forth. Of course, since Playmobil figures only have swivel necks, shoulders and wrists, and a hinged waist, you won't be getting a very natural pose out of him. There will never be a truly in-scale Stay Puft Marshmallow Man toy: he stood 112'6" (presumably that's not counting his hat), so he's about 19 times bigger than anyone else he'd interact with. 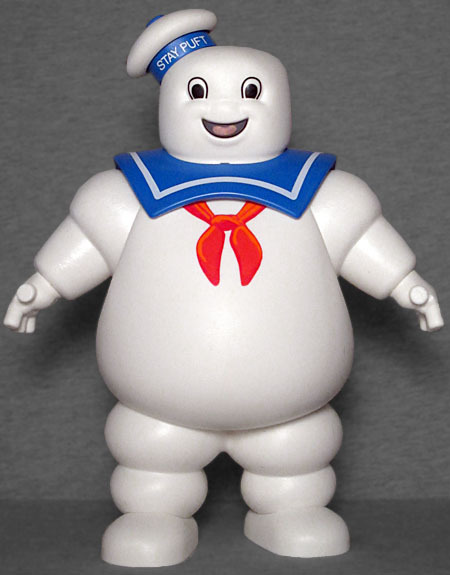 To put that in perspective, you are as big compared to a GI Joe figure as Mr. Stay Puft is to the Ghostbusters. This figure maxes out below the 7¾" mark, but he'll still look good facing off with the Minimates, if you didn't get DST's bank.